My heartburn with these folks comes in the form of intent. What I want to know is, is did SurfCast approach MSFT with the idea of a license before they went and filed suit? 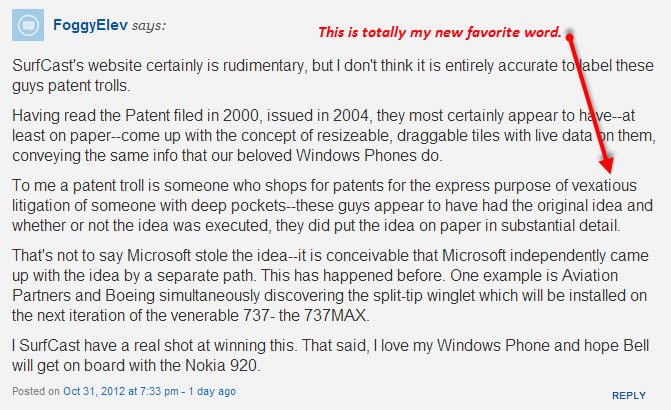 That goes a long way in telling me they are more of a “patent squatter” rather than an outright Troll wannabe. And I don’t even like the squatter term for them either, though admittedly that’s pretty much based on the fact that the owner of Fuzzibuns got her fuzzibuns in a wad over a stolen idea and used that term with The Sharks. I can’t get behind whiners. Or the terms they use. <– That’s petty, no? Sorry. What I am hoping happened, and maybe someone can confirm this, is that they developed this Live Tiling algorithm or whatever you want to call it and patented it and then ran out of steam. Lost their mojo? Couldn’t fund a company to actually build an OS around it? Knew that if they did build an OS, it would never compete with Mac OS or Windows? Who knows. Maybe they never intended to build anything with it but knew they were on to something and were hoping that someone would pay them for a license at some point in the future. This kind of thing happens all the time in business. You start up a company in the hopes that some day someone bigger will buy you up and let you retire in style. You put in a ton of work for 10-15 years and then sail softly down to your own private island on your buy-out parachute after you’re purchased. That was the plan all along. I’d love it if that’s what SurfCast was doing because that’s cool. Even cooler if they’d get all authentic and vulnerable and admit it to the world. Let’s face it, it’s not like they are actually running a company or anything, judging by their website. SurfCast? Get a new web designer because dayum, y’alls site is awful. (And it evidently always has been. Thank you, wayback machine.) I have a ton of beach pictures in my personal portfolio and probably some of them even have surfers in them so I can get you a better picture than a lady from the 50’s fishing off some random beach, and hereby offer to do so free of charge. And hello? Fishing is not the same as surfing. I don’t get how your picture fits your company name at all, is what I am trying to say. Back on point…companies who intend to make and/or sell something don’t have ugly static websites with pictures that do nothing to enhance their brand. This helps my case. As of this writing, I have emailed the company asking them if they asked Microsoft to take a license before suing. I’m taking bets on whether or not they will reply. My bet is no, as in “no”body, which is who I am to them. LOL! Nevertheless, if I’m right about their intent, then we need a new category for companies/people who patent an idea knowing they’ll never build anything with it but rather fully intend to approach companies who may license it without them having to sue God and everyone else. Which is not the same thing as purchasing a patent with the intent to shake people down. Slightly nuanced difference there, but I see it.